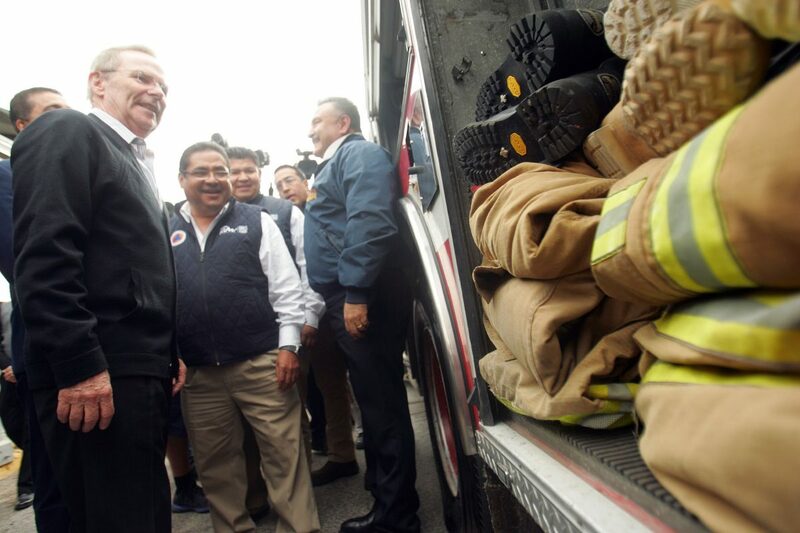 McAllen Mayor Jim Darling, far left, looks over a surplus firetruck and equipment that was exchanged from the city of McAllen to the State of Tamaulipas Civil Protection Regional Center in Reynosa at the Hidalgo-Reynosa international bridge Wednesday, Dec 13, 2017, in Hidalgo. HIDALGO — With southbound traffic stopped, representatives from two nations met Wednesday at the middle of the Hidalgo-Reynosa International Bridge. 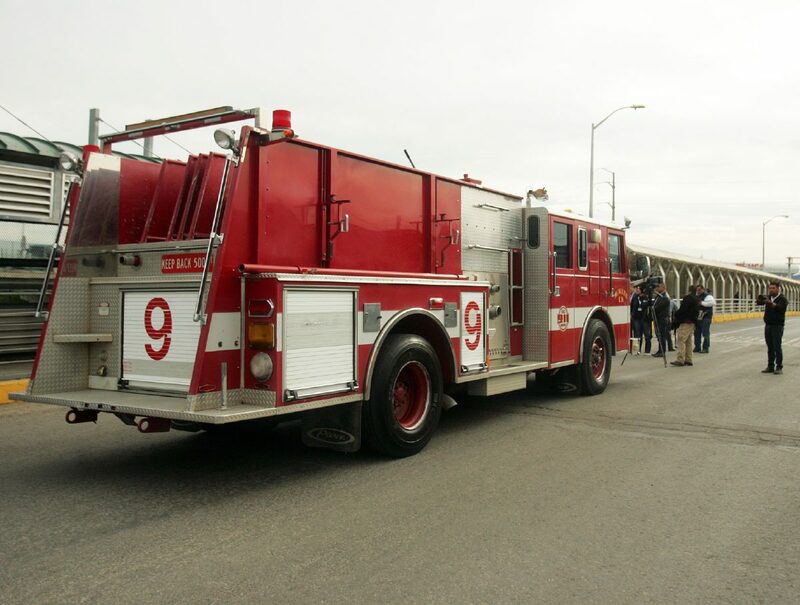 A 1994 Pierce Lance firetruck rumbled, sirens blaring and lights flashing, toward the middle of the bridge with a group of Mexican officials awaiting the donation. The truck pulled to a stop right before crossing the binational boundary and the driver hopped out. McAllen gifted the surplus firetruck and equipment to the State of Tamaulipas Civil Protection Regional Center in Reynosa. The truck seats six and can carry 500 gallons of water and is capable of pumping 1,500 gallons a minute at full capacity. Valued at $15,000, the truck has logged 111,717 miles for the city. McAllen Mayor Jim Darling, center, stands in front of a surplus fire truck and equipment that was exchanged from the city of McAllen to the State of Tamaulipas Civil Protection Regional Center in Reynosa at the Hidalgo-Reynosa international bridge Wednesday, Dec 13, 2017, in Hidalgo. A surplus firetruck and equipment was exchanged from the city of McAllen to the State of Tamaulipas Civil Protection Regional Center in Reynosa at the Hidalgo-Reynosa international bridge Wednesday, Dec 13, 2017, in Hidalgo. 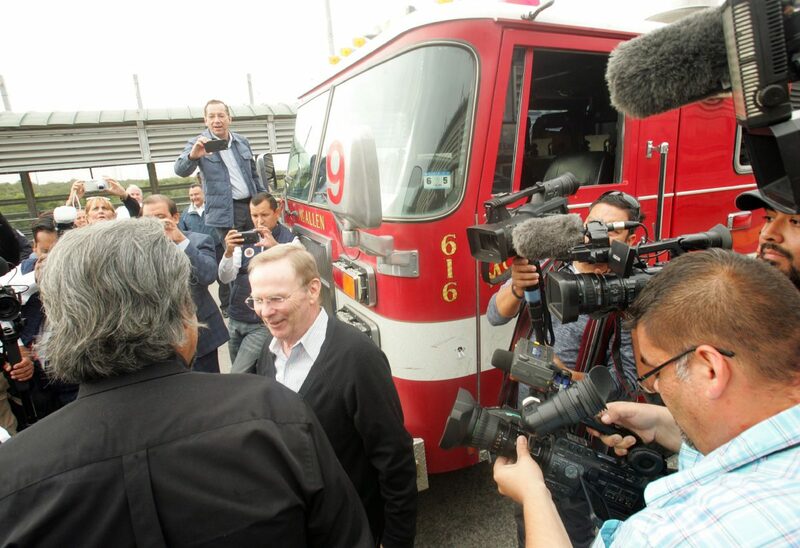 McAllen Mayor Jim Darling steps out off a surplus firetruck and equipment that was exchanged from the city of McAllen to the State of Tamaulipas Civil Protection Regional Center in Reynosa at the Hidalgo-Reynosa international bridge Wednesday, Dec 13, 2017, in Hidalgo. 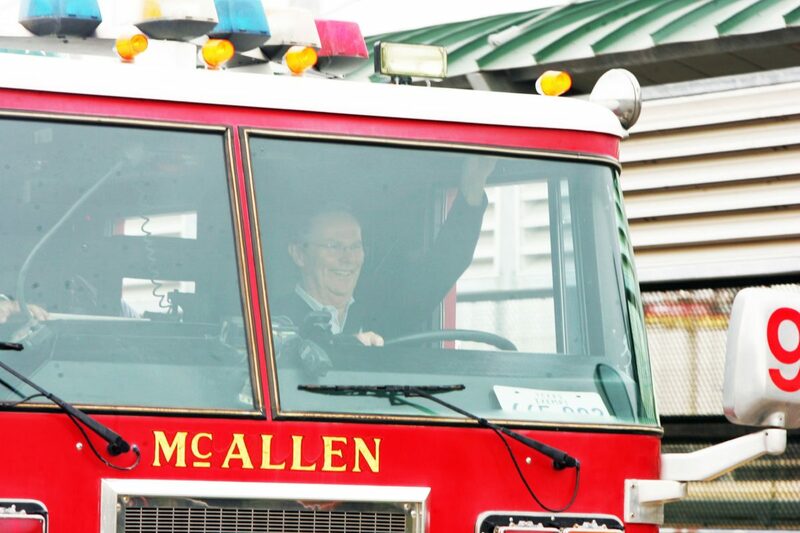 McAllen Mayor Jim Darling waves as he drives a surplus firetruck and equipment that was exchanged from the city of McAllen to the State of Tamaulipas Civil Protection Regional Center in Reynosa at the Hidalgo-Reynosa international bridge Wednesday, Dec 13, 2017, in Hidalgo. 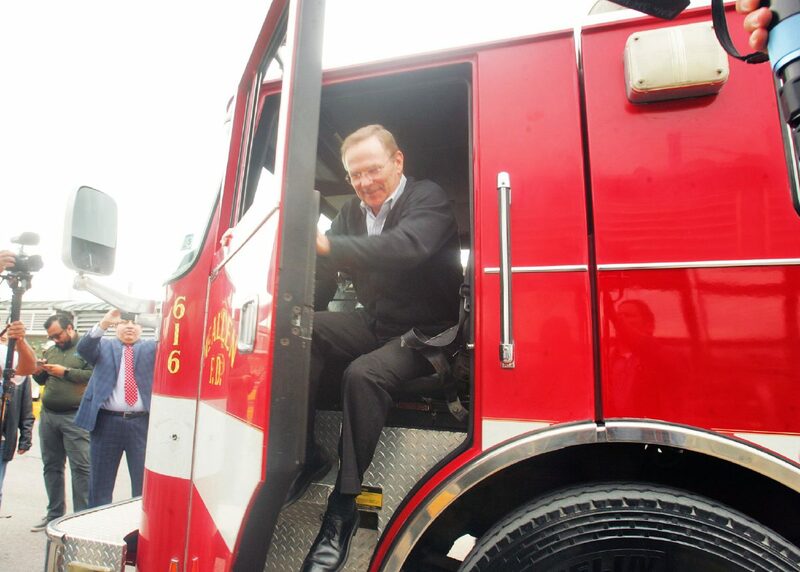 Darling said this is the second firetruck exchange he can remember during his four-and-a-half years in office. The exchange is part of an interlocal agreement the two governments approved. Alejandro Mayne Valdez, director of state heritage for Tamaulipas, said they greatly appreciated the gift. Francisco Galvan Garza, who heads the Texas-Tamaulipas Trade Office, was representing Tamaulipas Gov. Francisco Garcia Cabeza de Vaca at Wednesday’s event. Bridge officials halted traffic for 10 minutes — “they stopped it for a half-hour for the abrazo ; didn’t want it to be that long,” one said — while McAllen and Tamaulipas officials mingled, thanking each other for working together. McAllen Fire Chief Rafael Balderas opened three back hatches of the truck to reveal “bunker gear,” or protective equipment. Tamaulipas officials thanked Darling for the truck and equipment while those crossing the bridge stopped to snap photos on their phones.